Instant pot mashed potatoes are my favorite side dish to pair with chicken and green beans, but of course, it works well with other combinations of meats and veggies. Russet potatoes, water, butter, milk, salt, pepper, and chives are thrown into an electric pressure cooker to create creamy and satisfying spuds with ease. Creamy mashed potatoes are a side dish that is hard to resist. Often times, it’s the most popular dish at the table. This recipe is made with simple ingredients like potatoes, milk, butter, and flavorful seasonings. Potatoes can release lots of starch when cooked, creating a gluey and thick mess if not properly combined, so I’ll show you all the right steps. To add another layer of complexity, home cooks are ditching the slow cooker and using pressure cookers, like the Instant Pot, to quickly prepare meals. I’m going to show you how to make mashed potatoes the right way using this handy multi-cooker. If you’re looking for a low effort mashed potatoes technique that doesn’t require boiling a big pot of water, the pressure cooker method may be a good choice! Check out my Instant Pot guide to get you started if you’re new to this device. With over 200 types of potatoes, selecting the right varietal can be a daunting task. Not to worry, I can help! To make light and fluffy instant pot mashed potatoes, use brown-skinned Russets. These should be easy to find at most grocery stores. Russets are a starchy type of potato, that gives a mealy, flaky texture, that’s great for mashing. However, the high starch content is great for absorbing liquids but can become gummy in texture if not properly made. Another popular option is Yukon gold potatoes. They are an all-purpose type of potato, being less starchy but more dense in texture. You can even skip the peeling because they are thin-skinned if you want more a rustic mash. For this recipe I use Russets, but either will work. Russet potatoes are peeled and added to the pressure cooker. It’s good to keep the potatoes whole instead of cutting into smaller pieces because of the high amounts of pressure and temperature built up in the unit that will cook the potatoes swiftly. If they’re too small, the pieces will crumble easily and make it a challenge to drain the water later. The potatoes are set on top of the metal insert that comes with the Instant Pot or the steamer basket. This allows them to be elevated above the water to improve steam circulation and prevents the potatoes from becoming soggy in water. The potatoes are cooked on high pressure for 20 minutes, then naturally released for 15 minutes. They should be tender when pierced with a knife or fork. Make sure to discard the water at the bottom of the pot before mashing. In my traditional stovetop mashed potato recipe, I like to push the cooked potatoes through a sieve to create a lighter product. However, since the potatoes are whole and the starches are still trapped inside the food, a gentle initial pressing with a potato masher is a better option. Mash enough to just break down the structure, but not over mix, otherwise, the starches released from the plant’s cell wall will thicken and become gluey. Butter or any other type of cooking fat/oil like olive oil or coconut oil provides a rich mouthfeel to the mashed potatoes, but that’s not all! The fat coats some of the potato starch, preventing the interaction of the water in the milk with the starch molecules. This is important because the potato starch acts as a binder and thickening agent when combined with a heated liquid. To keep the potatoes light, we want to reduce this from occurring. The fat acts like small waterproof shields, surrounding the starch. The butter is gently folded into the potatoes before adding in the milk. If desired, mash the potatoes more at this point for a smoother consistency. Gently fold in the salted milk in three additions. This will help the potato starches gradually absorb the milk. Taste and season with more salt and pepper and garnish with more butter and chopped chives. Get the potatoes in the Instant Pot going first, while in the downtime prep the main entree. These irresistible spuds are the perfect addition to your meal, no matter if it’s a typical beef or chicken dinner or Thanksgiving celebration. I can’t wait to hear what you think in the comments section below! You might have noticed that once a potato is peeled, cut, then left out in the open air it begins to turn brown much like an apple or avocado. This happens relatively fast because when the cell walls of the potatoes are exposed to air, they begin to rapidly oxidize and change color. To prevent this from happening, immediately submerge the potato in cool water after it’s peeled. The water creates a barrier from the air, protecting them from discoloration before cooking. Russet potatoes, butter, milk, salt, pepper, and chives are thrown into an electric pressure cooker to create this Instant Pot mashed potatoes recipe. Peel each potato and immediately submerge them in a large bowl of water to prevent them from turning brown. Place Instant Pot wire rack insert in the pot. Place the potatoes on the rack and pour in 1 1/2 cups of water. Place the lid on the Instant Pot, turn and lock. Press "Manual" button on the Instant Pot on high pressure, and then set the timer to 20 minutes using the "+" or "-" buttons. Once cook time is complete, allow the Instant Pot to naturally release the pressure for about 15 minutes. Carefully remove the lid, opening the top away from you as steam will be released from the pot. Transfer potatoes to a plate and discard the excess water in the pot. Transfer cooked potatoes to the pot and use a potato masher to gently break down the potatoes, but not completely mashed. Use a spoon or spatula to gently fold the butter into the potatoes. Lightly mash the potatoes more if desired for a smoother consistency. In a microwave-safe bowl, whisk together the milk and salt. Microwave the milk and salt for 45 seconds until warmed, about 120ºF (49ºC). Gradually fold milk into potatoes in three additions, until the milk is absorbed. Garnish with black pepper and chives. MAKE IT DAIRY-FREE OR VEGAN: Non-dairy milk like cashew, almond, coconut or soy can be substituted for dairy milk. The flavor will differ slightly and may not be as creamy. Butter can be substituted with vegan butter or olive oil, however, will change the flavor of the mashed potatoes. 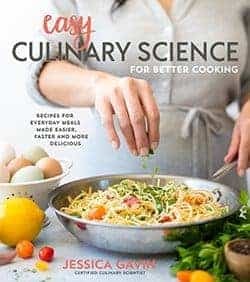 Jessica – Thanks for the great recipe. Question: once made can the mashed potatoes be held in the instant pot? I always have a challenge getting potatoes, gravy, and turkey to the table at the same time. Thanks!! Hi Carri- Yes, the Instant Pot has a “keep warm” setting you can select. Place the lid with the valve open. If needed, you can add a little more warmed milk to the mashed potatoes if they get too thick before serving. 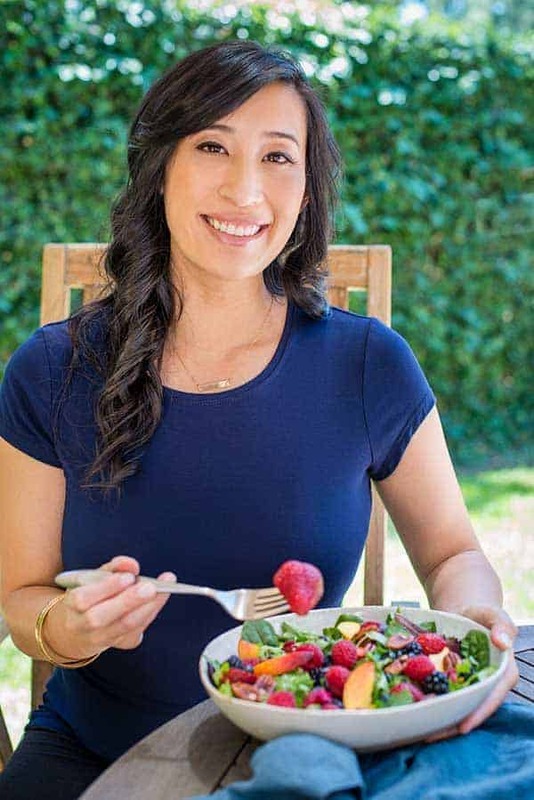 I just love your Instant Pot recipes because you do something most food bloggers do not do..,you actually give an approximate “up to pressure “ time and “pressure release” time. This is rarely given on Instant Pot recipes that I have seen, and it is very welcome! Without an indication of this, many cooks are confused as to why their recipe took longer than the stated “cook” time. Thank you so much for this! Also, your recipes ROCK! 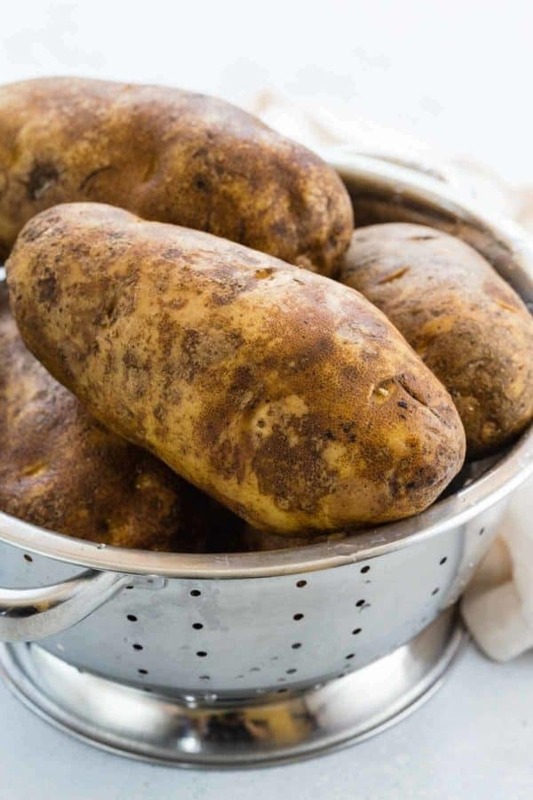 I am new to the instant pot but am looking forward to trying this recipe but I need more than 2 lbs of potatoes – if I doubled the recipe would I need to double the amount of water I pour into the instant pot? Hi mary- Yes, I would double the amount of liquid. It might take more time to get up to pressure. Try not to fill the instant pot over halfway with ingredients! Hi. With 25 people coming for Thanksgiving, I want to double this recipe too. I do have a Duo 8qt. Would you happen to know if I can double the recipe, using the 8qt? I would quickly test to see if when you add in the steamer basket and potatoes if it’s more than 2/3 full. If so I would just pressure cook the potatoes in 2 batches, and then mash them together.